A recent medical study in the United Kingdom found that one in two people will get cancer at some point in their lives. Equally disturbing, the second leading cause of death in the United States, as of 2015, was cancer. With such a high prevalence of cancer in our society, it’s important to know how to deal with the disease on a secondary level. When someone you love is diagnosed with cancer, you may feel helpless or like you don’t know what to say. 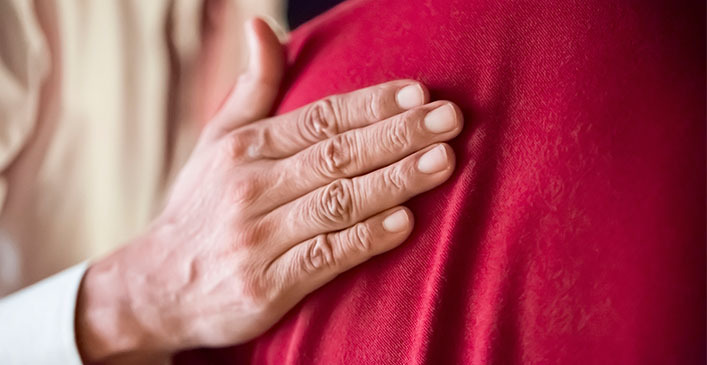 While it’s perfectly normal to feel that way, there are a few simple things you can do to ensure your friend, or family member, feels supported in their time of need. Cancer doesn’t just impact the person with the illness, it extends its reach far out among friends, family and neighbors. When someone you love gets cancer, it can feel like the end of the world, but not every cancer diagnosis is a death sentence. Nevertheless, dealing with your own feelings on the matter is an important part of being there for the affected person. You may feel a spectrum of emotions from the beginning and that’s okay. There is no wrong way to feel. You may experience anger, sadness, worry, self-blame, regret, or any number of other feelings specific to your own situation. Deal with them one at a time and allow yourself to accept the reality of the situation, while still maintaining a sense of hope. Only when you’ve come to terms with the reality of your loved one’s illness can you really assist them in dealing with it themselves. Find out as much as you can about your loved one’s illness without making them uncomfortable. Whether that means asking them directly or through another family member, or even asking their doctor if you are a caregiver, the more you know, the better prepared you’ll be. Some things you may want to find out include their prognosis, the affected areas of the body, possible side effects of their treatment and self-care at home. If they are okay with talking about the cancer with you, ask them if anything hurts and try to ease their suffering the best you can. If a non-family member is sick, try to avoid secondhand gossip through co-workers or other friends. If the affected person makes it known they don’t want to share details about their illness, respect their privacy. There are other ways you can still educate yourself about cancer in general, which may be helpful if you’ve never known someone who had it before. The American Cancer Society and other cancer charities have websites that are a wealth of information. Additionally, there are a number of excellent non-fiction books from cancer survivors that may give you perspective on what it’s like to have cancer. One of the most thoughtful ways to help someone with cancer is just by offering to do things for them, whether asked to or not. Helping with grocery shopping, daily errands, childcare, or dealing with bills are all things that can make a world of difference to your loved one. Cancer treatment is notoriously exhausting, especially chemotherapy. Once simple tasks might seem extremely difficult now that your friend or family member’s body is battling cancer. Anything you can do to make their life easier will not go unnoticed. Providing entertainment for the sick person is also a nice thing to do. Giving them gifts like movie theater, concert, or performing arts tickets are all welcome distractions. Gift certificates to spas or salons are also appreciated. If they’re mostly bedridden, puzzles, books and new music can help cheer them up and give them something new to pass the time with if they’ve exhausted all their other activities at home. Cancer is no picnic and emotional support can often make a difference in helping someone recover. Show your loved one you care with kind words from the heart and let them know you are thinking about them. Ask them how they’re feeling, and follow their lead on what seems appropriate for the conversation. Humor is a great tool to lighten up serious situations, but only use it if it suits the person or they’ve already initiated it by poking fun at themselves. Sometimes, the person with cancer may ask you to simply keep them company at home. Even playing board games, watching a movie, or enjoying a nice meal together can make them feel loved and supported. Depending on the person, they may even ask you to go with them to the doctor. This is of course up to you and your comfort level, but they may feel the need to have someone else there to ease their fears and ease the struggle that comes from having to deal with a potential fatal disease. Most importantly, be honest about what you’re able to do for them, and never let them feel like they’re a burden to you.